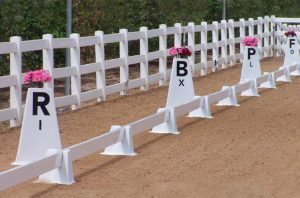 These Dressage Elite Letters are designed to withstand even the windiest conditions. These exceptionally stable cones have the appropriate letters and center line letters painted on at a height that allows the letters to be seen from a distance. Our unique design prevents the cones from sticking together when stacked. The recessed cup at the top of the Tower Letters allows you to decorate them with flowers or a flower pot for a touch of color.